What is El Tour de Tucson? Why Should I "Ride To Save Lives" / Fundraise for LOOK! Save A Life? Is America's Largest Perimeter Bicycling Event for Cyclists of All Ages and Abilities. Our Purpose is to promote the Safety & Awareness for ALL who utilize our Public Roads. Our Mission is to Foster an Environment of Safety for Cyclists & Motorists by Increasing Awareness, Emphasizing Education, & Having an Active Part in the Community. You Pledge to Raise $350 or more for LOOK! Save A Life. This year, LOOK! Save A Life will be covering your initial Registration and Processing Fees as courtesy to you. In return, you will remain committed to reaching your goal. LOOK! Save A Life will submit Your name for Registration once you've met Your Minimum Pledged Goal of $350. Contributions paid to LOOK! Save A Life are tax-deductible as allowable by the I.R.S. Satisfaction of Raising Awareness for the Safety of All Who Utilize Our Public Roads! Proceeds Benefit Cyclists (like yourself), in an effort to protect Vulnerable Users while out there on the open road. Fundraising not only supports a great cause, it doubles as an opportunity to pedal awareness to all of your family / friends as you train for El Tour. Gives you the opportunity to be rewarded with attractive gear. (Polar-Water Bottles, Reflective T-Shirts, High Quality Jerseys, or even the treasured "Conquistador" (Trophy of El Tour de Tucson). A professional American racing cyclist. In 2014, he was the National Racing Calendar (NRC) Individual Champion / Top Points Leader and placed 2nd overall in the 2014 USA National Pro Road Race. "Much of my life is spent on the Road, working toward my future. I realize how quick my life could change to one inattentive driver. A frightening reality that not only affects me, but anyone enjoying their bike. A Mother, father, or child - everyone is at risk. This threat shouldn't scare people away from enjoying a ride. Instead, we as cyclists & motorists need to learn to mutually respect one another for a harmonious relationship on the road." A professional American Road Racing Cyclist. In 2014, he won the United States National Road Race Championships. He was the National Criterium Champion in 2015. He is also a 3x winner of El Tour de Tucson. Michael Balazs is a husband, father, son & friend. 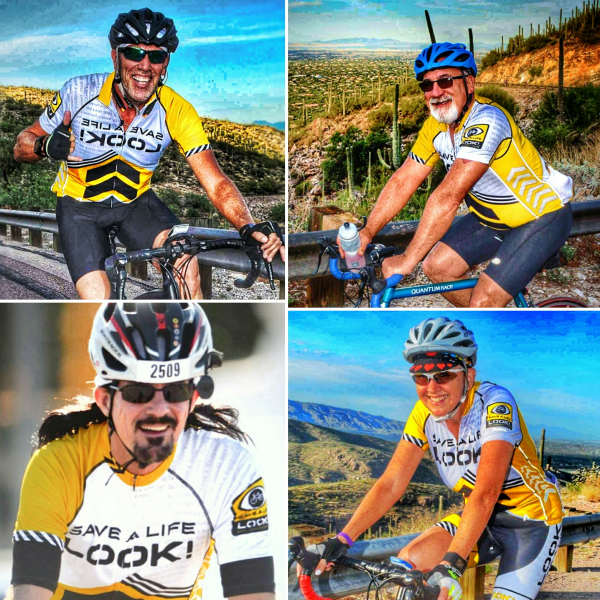 This will be his 3rd year riding for ‘Look Save a Life’ in the El Tour de Tucson. He rides for ‘LOOK! Save a Life’ to help support its mission by being involved in creating an environment of safety for all who utilize our roads. Most of us cyclists are dedicated, aware of the traffic laws, and we will do everything in our power to follow the laws, to be seen by motorists, and to stay out of the way as much as possible. We also are motorists and we want to encourage a better and more respectful relationship when sharing the road. The education fostered from ‘Look Save a Life’ is also for the not-so-dedicated cyclists, the commuters, and casual cyclists who may not be aware of the traffic laws. My experience with riding for ‘Look Save a Life’ has been fulfilling and at times bittersweet. It is fulfilling to know that I am part of a team and community that can make a difference. It is bittersweet because there are so many deadly distractions on the roads today that could tragically take us, or our loved ones, away at any moment. To wear the ‘Look Save a Life’ jersey says that I represent a meaningful and life-saving cause. And it doesn’t stop after the El Tour ride. There is a responsibility for all of us on this team after the ride and throughout the year. When tragedy occurs on our roads, we on the ‘Look Save a Life’ team are there to support, raise the needed awareness, and hopefully bring some good out of the tragedy. Additional event information can be found at http://www.perimeterbicycling.com/el-tour-de-tucson/.